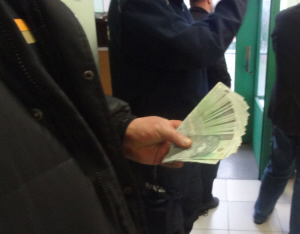 On November 21, members of ZSP and Sierpień 80 went to the office of Impuls agency to demand that immediate payments be made to ex-workers who hadn't received any money for months. The agency specializes in hiring poor and desperate retirees who still have to work for a living. These workers were hired at 80 euro cents per hour and often worked up to 250 hours a month just to make 200 euros. To add to the problem, the firm often does not pay people for months, leaving them without money to pay bills or anything. Many workers have quit after a few months of not getting made and were not able to get any money. We went to the office of the agency and demanded that the people be paid everything they were owed immediately. At first the Impuls people claimed that there was no money, even though today they are supposed to pay people. (It was typical that workers would should up on pay day and be told there was no cash and to come back another day.) We said we would not move until they were paid. The action was meaning filmed by a TV crew. After some time, one of the managers came and paid people. The four workers who went today received over 3000 euros in total. Most were owed 3-4 months salary. Previously actions also resulted in payments totally to over 2500 euros. Everybody was very happy that these people received some money, because the situation for them could be really tragic. There are some other people owed money who couldn't come because they work elsewhere and couldn't get time off. This shows how hard it has been for them and that not everybody can afford days off to keep going to this office. But Impuls knows that we will be back with at least 2 more people. We also do not accept the situation that these workers were hired on trash contracts instead of normal ones and, because of this, their salaries were less than 1/3 of the minimum wage, they received no overtime payment or holidays. We are trying to get a legal decision that they should have been normally employed so that they can claim the difference between what they were just paid and what they should have been paid. In the meanwhile, at least they have some money to pay the bills and put food on the table thanks to direct action. We continue to inform people about the situation and encourage people to take action. In addition, we are trying also to educate people about their rights as employees and to fight against the abusive use of trash contracts and the use of the subminimum wage.